Even if you know D.C. well, you may not know anything about NoMa. Technically defined as the area immediately north of Massachusetts Avenue, NoMa is the area to the north of Union Station up to and around the New York Avenue Metro stop that has seen incredible growth in high rise (for D.C.) office buildings and apartment buildings over the past few years. While NoMa is not currently known for its cuisine or nightlife (with the possible exception of Todd Gray’s Watershed restaurant), a new restaurant has an exciting opportunity to elevate the dining scene in the area and begin to place it on the culinary map. 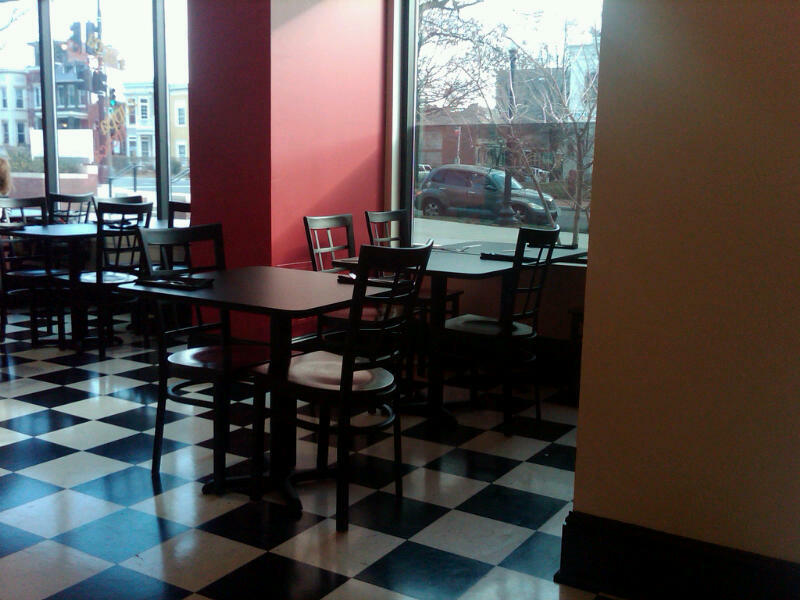 That restaurant is Zuppa Fresca, located on the ground floor of the Loree Grand apartment building (250 K Street NE). When the Loree Grand building first opened, it was going to have a restaurant by Gillian Clark (of The General Store and others). However, Clark’s restaurant never opened, and Zuppa Fresca quickly took its place. Zuppa Fresca is already open serving breakfast and lunch Tuesday-Sunday; however, the restaurant has much more planned in the weeks and months ahead. Maryland. Celia started his culinary career when he was 13 cooking in his father’s restaurant. After his early start, he went on to master his skills at L’Academie de Cuisine so that he could become a part of the D.C. dining scene. He believes that it isn’t enough simply to make great food. For him, “a chef has to be able to tell a story with his food and it has to be an interesting story.” He thinks that NoMa is the place to develop his vision. In our interview he had warm thoughts about NoMa saying that it will “have explosive growth in the upcoming years and the food scene will need to grow.” He also believes that other chefs will follow the lead and begin making NoMa a dining and going out destination. Zuppa Fresca (as you could probably guess from the name) is Italian cuisine but don’t be thinking boring chicken alfredo. Celia tells us that his dinner menu will buck the usual Italian restaurant theme and not serve many pastas. Instead, his menu will feature a combination of traditional Italian flavors and modern dishes that have a “Sicilian flair.” He says that he wants to showcase Sicilian and Italian food “that is overlooked by other Italian cuisine.” Rather than excessive amounts of pasta, expect different kinds of seafood and veal. He expects that the menu will change daily and that he will be in the kitchen personally preparing many of the dishes. Celia plans to make Zuppa Fresca a complete dining experience. While Zuppa Fresca does not currently have a liquor license, he plans to have extensive drink offerings soon. Diners will be able to order their food with wine or beer pairings, and Zuppa Fresca will also have full martini menu. While NoMa currently does not have any real bars, Celia believes that Zuppa Fresca will have a vibrant bar scene (its proximity to the west end of H Street may help). The restaurant will have a large outdoor patio in the front so that diners can enjoy nice evening weather. ingredient), a typical chicken panini becomes excellent. Try it with the onion rings that are served with a nice garlicy aioli (hope you don’t have a date afterwards) and you have quite a tasty meal. 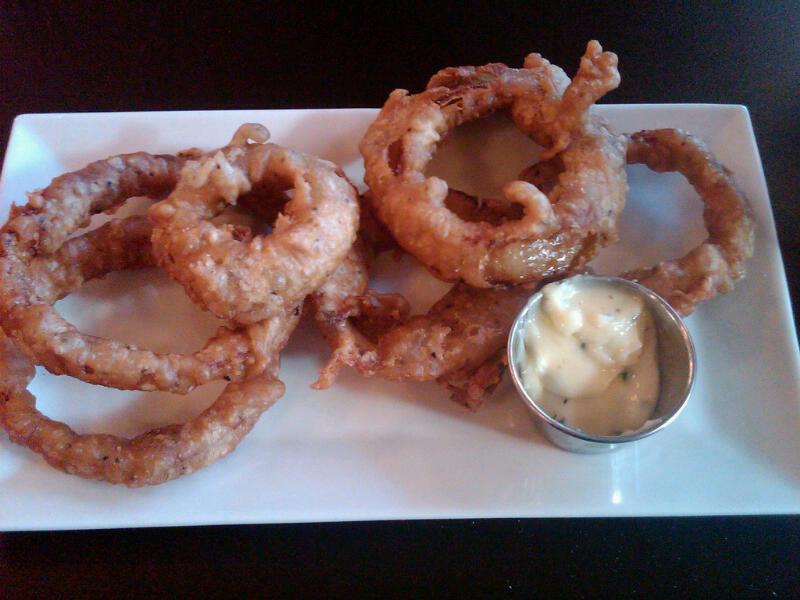 If you’re willing to indulge in a fried side, definitely go for the expertly fried onion rings as opposed to the sweet potato fries which came out slightly soggy. 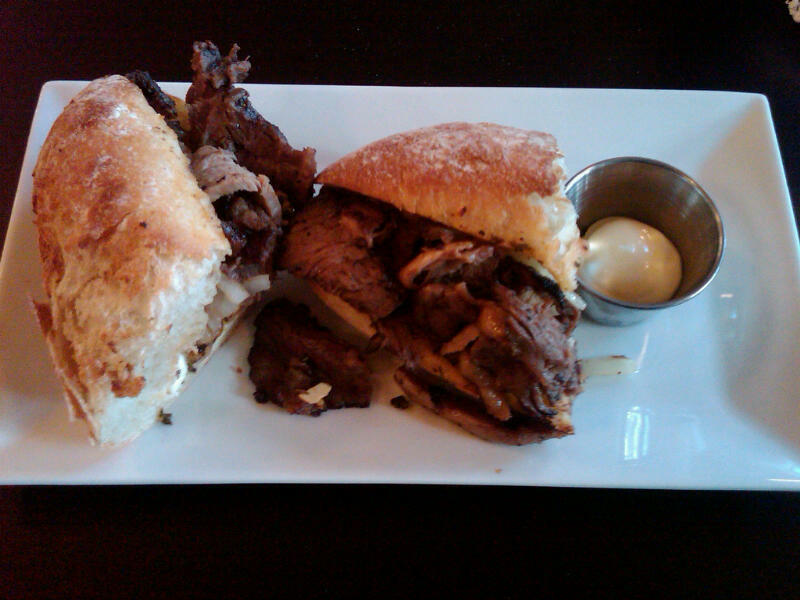 Also try the “italian cheese-steak,” a clever take on a philly cheesesteak featuring a nice tomato sauce and pair it with the roasted corn, pepper, and tomato soup. The menu changes frequently and recent additions have been delicious as well. The three mini burgers made out of ground veal with a light aioli sauce was one of the best lunch meals that we have had in quite awhile. The roasted beet and goat cheese salad will have you thinking that spring is already here even in the middle of winter. Despite being the first floor of an apartment building, Zuppa Fresca is a very interesting space. From the entrance, the restaurant goes back to the left with several window tables that are slightly tucked away because of several walls that jut slightly out. After walking past these tables, to the right are several more tables and the bar which faces into the open kitchen. The floor is black and white checkers and the high ceiling has several lights with black frames hanging down. The walls are painted red or white and adorned with several modern paintings featuring bright colors. When we entered, we were asked for our name and email address (even though we didn’t have a reservation) so that they could enter us into their Open Table system. While we appreciate the effort, we found their persistence in getting our information a little strange. Otherwise the service was very friendly and helpful. During our visits Chef Celia was in the kitchen cooking for part of the time and greeting diners at other points. Overall, a very pleasant atmosphere. Zuppa Fresca is already off to a good start. Based upon Chef Alfio Celia’s vision for his restaurant, we are very excited to watch the restaurant grow and hopefully begin making NoMa a culinary destination. 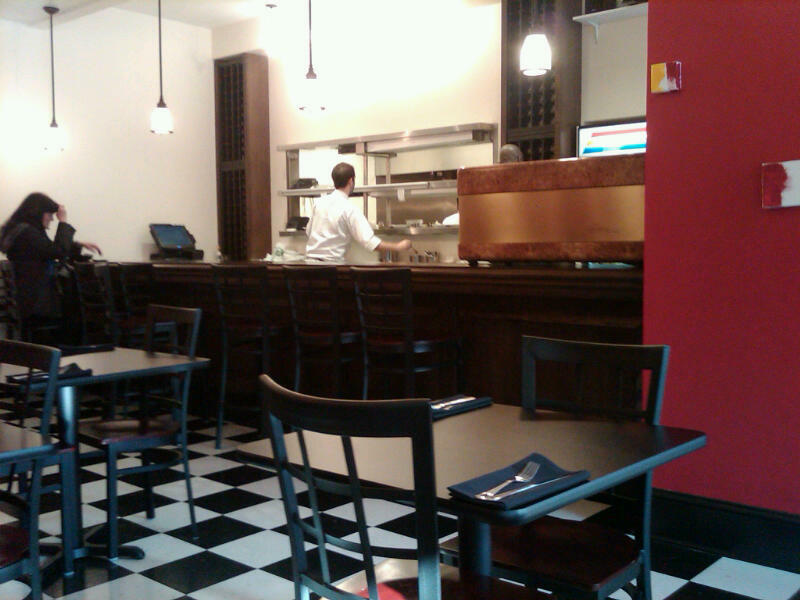 Update: Zuppa Fresca opened for dinner with full bar service on Saturday, February 18th. The crowd was somewhat light, but we very much enjoyed the saltinbocca di pollo which featured several generous slices of chicken breast topped with prosciutto in a light lemon butter sauce. The service had a few opening night kinks to work out (such as not having a printed drink menu) but hopefully these will be fixed soon. Zuppa Fresca plans on frequently rotating the menu and having several specials (such as the recent veal chop with mushroom risotto).